John Kendrick-Jones (Jake) began his research career in Birmingham University studying the contractile proteins in developing skeletal muscle [Nature (1967) 213:406-8]. For his post-doc studies he moved to Brandeis University in Boston and while investigating how muscle contraction is regulated discovered a novel myosin-linked calcium regulatory pathway [J.Mol.Biol. (1970) 47:605-9]. Up until then the troponin complex on the actin filaments was believed to be the sole calcium regulatory system in all muscles. In 1970 Jake joined the LMB and continued his work on myosin regulation, quickly establishing that the regulatory components were small subunits associated with the myosin motor domains which he named regulatory light chains [Nature (1974) 249:631-4]. Subsequently he demonstrated that all myosin IIs contain regulatory light chains and that they are involved in regulating and/or modulating myosin motor function and filament assembly not only in the different types of muscles but also in all cells [Nature (1983) 302:436-9]. In the early nineties he, together with other groups, discovered new classes of myosins, confirming that myosin exists as a superfamily composed of 18 major classes of motor proteins [Structure (1996) 4:969-87]. Latterly he has focussed on probing the cellular functions of the class VI myosins and has shown that they are multifunctional motor proteins involved in a wide and diverse range of cellular processes. Abnormal protein trafficking is responsible for many human diseases. Thus, understanding how the transport proteins function within trafficking pathways is essential for elucidating how these disease processes occur and identifying potential therapeutic targets. 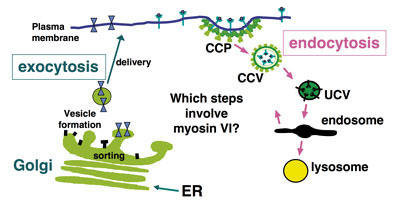 Since motor proteins, play central roles in intracellular transport we have focussed on identifying and characterising the intracellular functions of one of these motors, myosin VI. This is the only myosin that moves towards the minus end of actin filaments. 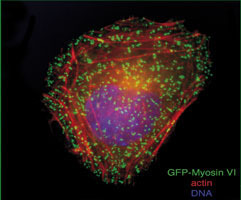 We have shown that myosin VI, interacting with specific adaptor proteins, functions in the Golgi complex (maintaining its organisation and sorting/secretion capability), in plasma membrane ruffles (involved in cell movement), in clathrin-coated pits/vesicles (playing a role in receptor mediated endocytosis), in autophagy (clearing protein aggregates) and in cell division (in the final stages of cytokinesis). Mutation or over-expression of myosin VI has been linked to a number of pathological processes including deafness, neurodegeneration and cancers. Our goal is to characterise the intracellular functions of myosin VI in sufficient detail to begin to understand how it is linked to these diverse pathological disorders. One exciting avenue is a recent collaboration set up with Dietmar Manstein (Hannover) testing the effects of his library of new small molecule myosin inhibitors on the trafficking assays we are developing in cells [J. Biol. Chem. (2011) 286: 29700-29708]. 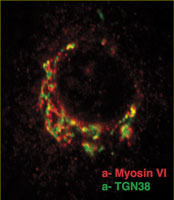 Multifunctional myosin VI has a multitude of cargoes. Nucleotide dependent shape changes in the reverse direction motor, myosin VI.